Plan and execute a kickoff meeting for your new prototype. Determine the right technologies to use for your prototype. Create a game plan for your prototype. 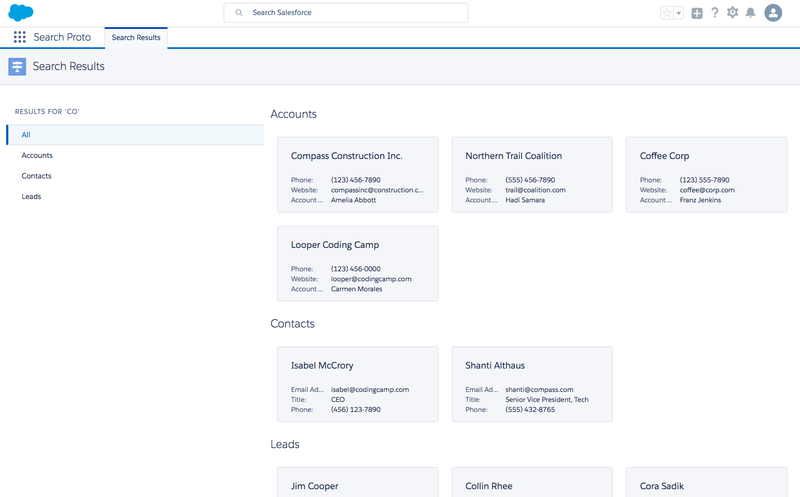 We’ve decided to implement a prototype for a new search results page in Sales Cloud. Let’s play the part of the user experience engineers (UXE) and create a game plan. We start by planning a kickoff meeting with the designers, UXEs, researchers, and product managers. In this meeting, we determine everyone’s roles on the project and the requirements and deadlines for the prototype. Our designers have given us some static images that detail a version of the new search results page. They have multiple different features on this page that they would like to A/B test, such as highlight color, navigation order, and the format and order of results. Ideally, the designers and research team want to do user research with customers in 3 weeks via video conferencing, and conduct some guerilla research with employees. It’s now time to decide what type of prototype to create, so we explore the questions talked about in the previous unit. The feature we’re developing—a new search results page—relies heavily on user input and decision making. The designers have also asked if the research subjects can search against their own org data. Given these considerations, an interactive prototype seems our best option. We need a highly customizable and flexible prototype where we can make frequent changes and test multiple versions of the features with some simple toggling. Great, but what technology do we use to create the prototype? Sound scary (or maybe just exciting)? Don’t worry, we walk through all this in a later unit. Once we decide on the type of prototype and the technology to use, we need a place where stakeholders can view progress and submit feedback. We call this a tracking board. This board can be as simple as a spreadsheet, or more detailed, like a Trello board. At Salesforce, we use the Agile Accelerator board, which is an app from the AppExchange. This is where we break up the design into small, workable tasks and order them by importance. Once that’s complete, we review the tasks with the designers and confirm the priority order. It’s also a good idea to schedule a meeting with the designers, UXEs, and researchers to determine the MVP (minimum viable prototype) needed for research sessions. This helps ensure the most critical features are developed first and the research script blends well with the prototype. But before we get to research scripts, in the next unit we break down the designs and start coding!